Wisdom Dental Floss cleans the hard-to-reach areas between the teeth and along the gum line where plaque and food debris can build up. 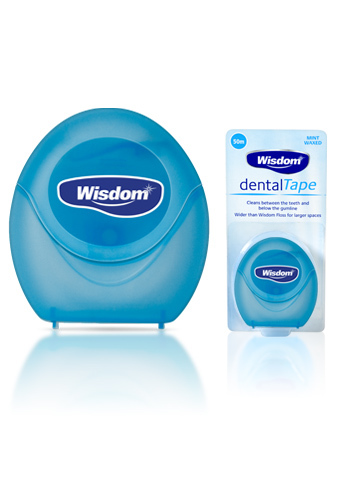 Wider than Wisdom dental floss, Wisdom dental tape is designed for increased plaque removal in wider spaces. Contains fluoride to help prevent decay, mint to leave your mouth feeling clean and fresh and a wax coating for a smooth easy clean. Use morning and night when brushing to help keep your teeth and gums healthy, to protect against gum disease and tooth decay and to keep your breath fresh.